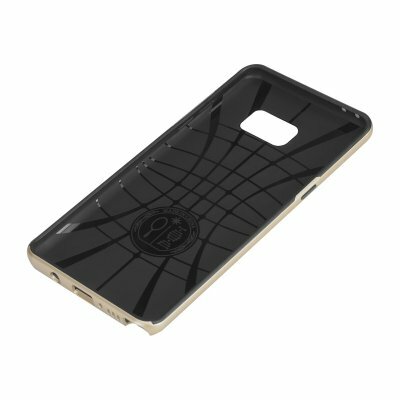 Successfully Added Protective Smartphone Cover - Fit For Samsung Galaxy Note 7 to your Shopping Cart. Modern day Smartphones are anything but cheap. The slim and sleek designs of the newest smartphones such as the Samsung Galaxy Note 7 look stunning, however, do bring along some disadvantages and a scratch or crack on your beautiful high-end smartphone is easily obtained. With this sleek and stylish protective back cover case fit for the Samsung Galaxy Note 7 you can be ensured that your smartphone keeps the looks as if it just came out of the box. Crafted out of durable black PC and PU material that has been surrounded by a stylish golden casing this smartphone case will protect your Samsung Galaxy Note 7 against the hassles of every day life – offering a stylish and affordable way to protect your beloved smartphone. This protective smartphone case for the Samsung Galaxy Note 7 comes with a 12 months warranty, brought to you by the leader in smartphone accessories as well as wholesale electronic gadgets..
Arabic: - حالة الهاتف الذكي وقائية - Chinese Simplified: - 智能手机的保护壳 - Czech: - Ochranné pouzdro na Smartphone - Dutch: - Smartphone beschermhoes - French: - Etui Smartphone - German: - Smartphone-Schutzhülle - Hebrew: - התיק החכם מגן - Hindi: - सुरक्षात्मक Smartphone मामले - Hungarian: - Védőtok Smartphone - Italian: - Custodia protettiva per Smartphone - Japanese: - スマート フォンの保護ケース - Korean: - 보호 스마트폰 케이스 - Malay: - Perlindungan telefon pintar kes - Norwegian Bokmål: - Beskyttelsesetui Smartphone - Romanian: - Caz de protecţie Smartphone - Russian: - Защитный чехол смартфон - Spanish: - Funda protectora de Smartphone - Thai: - เคสสมาร์ทโฟน - Turkish: - Koruyucu Smartphone çantası - Vietnamese: - Trường hợp bảo vệ điện thoại thông minh.